When I was growing up in the 50s my parents were firm believers in the maxim "children should be seen and not heard". That's why they didn't mind if I plopped myself down in front of that black and white picture-producing device in the corner of the living room. And boy what a world I escaped to. The Cisco Kid, Circus Boy and - my favourite - Adventures of Superman. I suppose the attraction with the latter was the fellow could fly. And I'd never seen a guy in tights before. The poor guy had to fly around with his underwear on the outside of his pants. Odd. In later years, in the 60s, I got hooked on Batman. 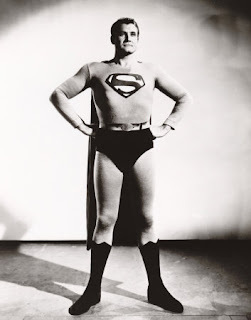 Like Superman, they belonged to the fraternal order of men in tights. But - and this was new - they also had female villains...who wore tights; Julie Newmar and Eartha Kit each taking a turn as Cat Woman, a villain torn between loving Batman and wanting to kill him. They kind of reminded me of Elly May of the Beverly Hillbillies and Daisy from the Dukes of Hazard. Their characters didn't really add a lot to the dialogue or the plot development. But their tight "costumes" contributed immensely to the scenery. I wasn't into The Hulk. He just yelled and turned green. His clothes got tight as he grew but he didn't have any scantily clad lady friends. The Six Million Dollar Man, followed by The Bionic Woman were interesting shows. And the characters sounded like a taut spring whenever they ran or jumped. Hoaky sound effects aside, who could forget the "fembots" Jamie had to battle from time to time. Not me. 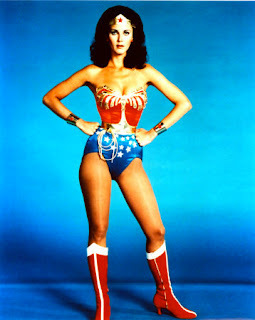 Which leads me to my favourite television super hero...a female, of course...Wonder Woman. I can't really recall any of the series' plot lines. But I'll never forget those tights. What there were of them! It's easy to see why that dude that played Superman committed suicide given that picture. I wondered a lot about Linda Carter as Wonder woman too. I wondered "Lordy, why not me?" On and on...she was hot! I guess that's one of her super powers. That and not doing anything but still looking good. Don: She was one of the most beautiful women with some of the least clothes on television! I'd like to do naughty things to her lasso. If you say that really fast, it sounds even dirtier. moooooog: ha-ha-ha. The caption contest is Wednesday. Don't forget Elizabeth Montgomery. Bewitched was on when I was too young to appreciate how pretty she was -- but I saw something about her on Biography a year or so ago. She was a cutie. Cdn Blend: Ah, but I don't recall Elizabeth wearing tights. You'll have to wait until I do a post on cute noses. You left out Batgirl. She was hot too. But Catwoman! RRRROWWWWW. When I plopped down in from of the old black and white, I watched Sky King and Lassie instead of the superheros. I guess I was never much of a superhero show kind of watcher, regardless if it was in living color or not. Little pervs in the making! I never liked these shows: but I did like Gilligan's Island, Bewitched, and I Dream of Jeannie. On Bewitched, you mean Endora didn't float your boat? HA!!! I wanted to be Wonder Woman when I grew up! Chris: Oh yeah, Batgirl. She had nice tights. Me-Me: Lassie and Tiimmy...that relationship was just unhealthy. Sky King was cool. But neither of them wore tights! Quirks: I watched 'em all. I still watch too much TV as an adult. You should flip over to dufusdownbeat this week. I'm doing TV themes that were on the charts. I had a serious crush on the Six Million Dollar Woman myself. I still do. She's hot. Mike: I think the last I saw of her she was doing TV spots for beds. I loved the Cisco Kid. It was my first introduction to non-whites besides the tap dancer on Lawrence Welk. I'm a heterosexual woman but I totally get the appeal of CatWoman. Bat Girl was so lame. I used to practice pulling off my glasses and whirling around in front of the mirror. Never could whirl fast enough to turn into Wonder Woman, though. But someone told me I looked like Diana Prince once. That's good enough for me. You and I grew up watching all the same shows. Julie Newmar is still the best Cat Woman. Jayne: It's a tough choice between the two. Eartha Kitt had such a purry voice. Looking For A Political Alternative?